Bill Bratton on NRA "stranglehold" over Congress: "Insanity." 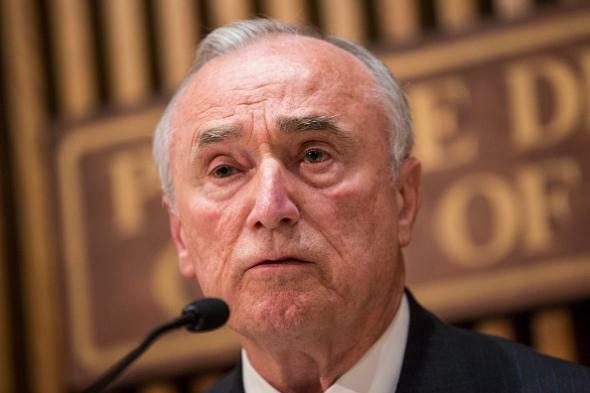 New York Police Department commissioner Bill Bratton discusses the death of NYPD officer Randolph Holder, who was killed by an armed suspect, at an Oct. 21, 2015 press conference. Bassier allegedly enlisted a handful of “straw purchasers” in the Atlanta, Georgia area, including both men and women, to buy weapons at gun stores, pawn stores, street dealers, and from web-based vendors. The straw purchasers allegedly bought the guns for $150 to $300 dollars, and were paid just $50 per gun for their troubles. Bassier allegedly transported the guns to New York via Chinatown bus. Bassier then allegedly flipped the guns in a Walgreens parking lot for between $800 and $1,200 per gun. Assault weapons were pricier, fetching approximately $2,000 to $2,500 per unit.